This is the first time I went to Victoria. 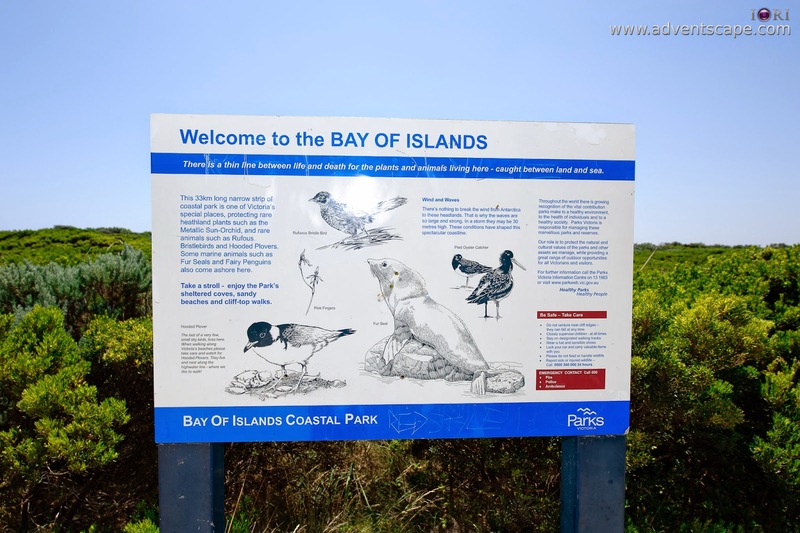 Though Melbourne is interesting, I became more interested at Bay of Islands Coastal Park. I wanted to go here during the golden hours, but since I'm with friends not into landscape photography, I had to adjust. We came from Apollo Bay (Big 4) and decided to have an early lunch at Port Campbell. We bought food that we cooked earlier. This gives us more time along the road as we don't need to decide where to eat. We also bought snacks to get us through the day. We arrived at Bay of Islands just after lunchtime. It's a bit of drive from Apollo Bay but an amazing view when the road curves at the coastline! 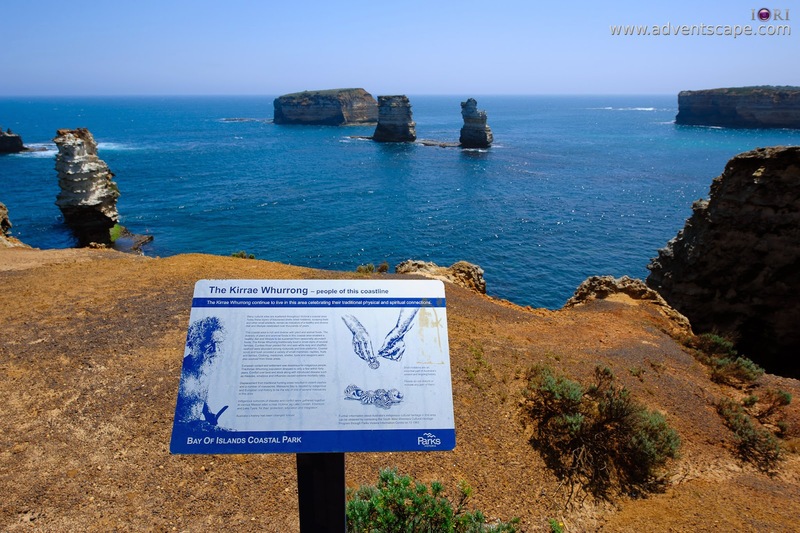 This is a must see if you're driving down the Great Ocean Road. Below is the map location of Bay of Islands. It's going near Warrnambool. The area is open space so it's warm when driving at the highway. It's all about landscape photography. We went there at daytime, so I can't comment anything regarding night photography. But from the looks of it, it's a great venue for astro photography. There are no lights on the path so going here will require torches and flashlights. Bring a friend, it's going to be lonely shooting at night! It only takes short walks going to the lookouts. I had no problem lugging in all my gear to the lookout. There are quite a few people visiting Bay of Islands, but they also disappear after some time. For the average tourist / visitor, it would only take them about 20-30 minutes. But for photographers, it would take a bit longer. Since I was with non-photographers, I stayed about 25 minutes. If I'm with photographers, I would stay up to 40 minutes tops. There are heaps of photographic opportunities. I mainly shoot the Bay of Islands as is. The only other technique I used was panorama. I didn't go after any HDR / high dynamic range photos. Looking at the histogram of my camera, the captured details are quite sufficient - this maybe caused by the sun able to light up most dark spots on the scene. Unfortunately, there were no clouds in sight. My sky is flat. But I like it this way than cloudy grey skies. There are two (2) lookouts, which we can call Lookout #1 and Lookout #2. Lookout #1 features a cove. This causes the waters to be calm and silent. The photo at the very top is captured at Lookout #1. The calmness lets you sail the waters! Below is a photo I got on the same lookout. It's a panorama photo captured via Nikon 14-24mm. Though the distortion on this lens is quite substantial and I don't have a panorama head, I still grabbed it - wishing that my stitching tool is powerful enough to stitch it. The sediments are amazing! They look like small islands that emerged from the ocean. Looking at the two (2) consecutive photos below gives a depth of how one would view the Bay of Islands. 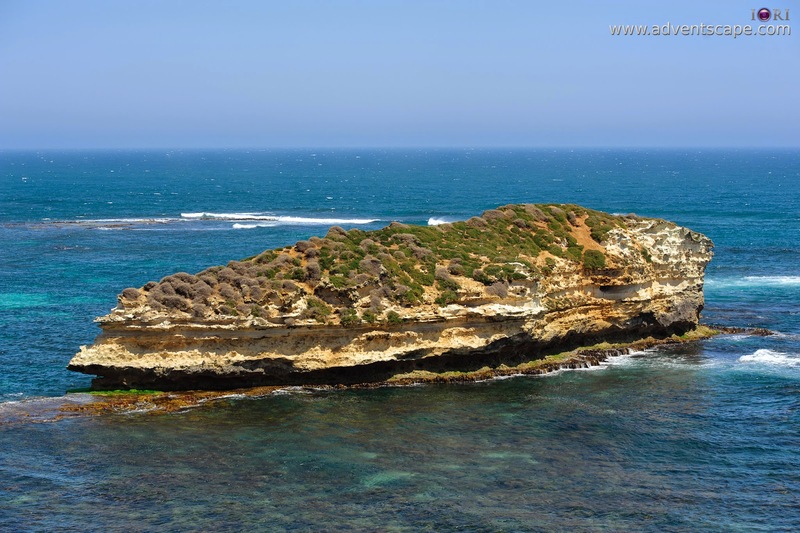 The photo below is when you look straight at the Great Australian Bight at Lookout #2. It's an open sea looking straight at the horizon. But what I did was I included some of the rocks / sediments as foreground that creates subject and texture. There is a thin line between life and death for the plants and animals living here - caught between land and sea. This 33 km long narrow strip of coastal park is one of Victoria's special places, protecting rare heathland plants such as the Metallic Sun-Orchid, and rare animals such as Rufous Bristlebirds and Hooded Plovers. 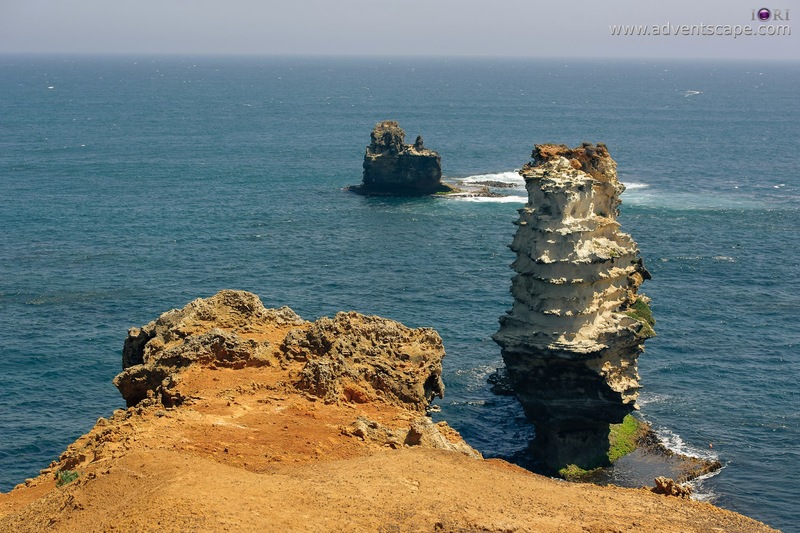 Some marine animals such as Fur Seals and Fairy Penguins also come ashore here. Take a stroll - enjoy the Park's sheltered coves, sandy beaches and cliff-top walks. The last of a very few, small shy birds, lives here. When walking along Victoria's beaches please take care and watch for Hooded Plovers. They live and nest long the high water line - where we like to walk! There's nothing to break the wind from Antarctica to these headlands. That is why the waves are so large and strong. In a storm they may be 30 metres high. 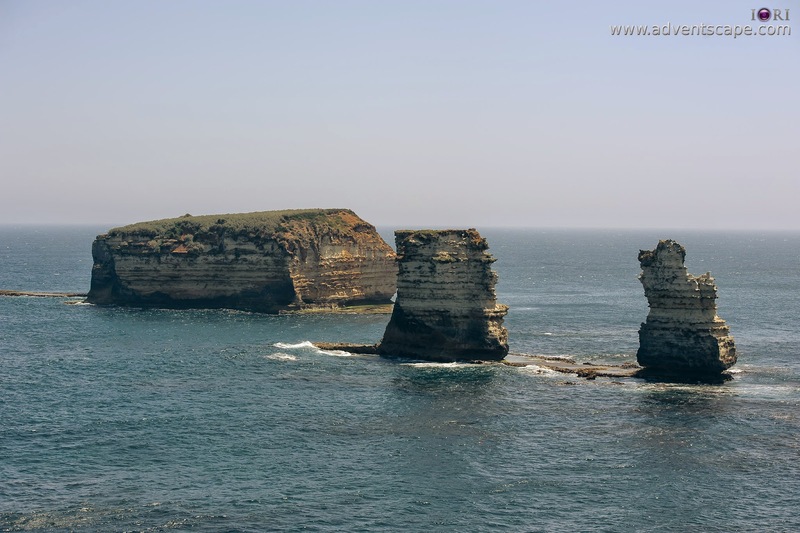 These conditions have shaped this spectacular coastline. Throughout the world there is growing recognition of the vital contribution parks make to a healthy environment, to the health of individuals and to a healthy society. Parks Victoria is responsible for managing these marvellous parks and reserves. Out role is to protect the natural and cultural values of the parks and other assets we manage, while providing a great range of outdoor opportunities for all Victorians and visitors. For further information call the Parks Victoria Information Centre on 13 1963 or visit www.parkweb.vic.gov.au. Lookout #1 (just go right when the walkway forks) will show a beautiful coastline going inward towards the mainland. I've seen small boats that row peacefully on this cove and waves are minimal. You'll see here that the ocean waters are so clean that you can see the reefs underneath the waters, even if waves are passing by. The wind blows calmly during our trip so hats aren't flying. The other lookout, Lookout #2 would be the best of the two! This lookout is directly looking (or you are directly facing) the Great Australian Bight, or open sea. The view is magnificent 180 degrees! Looking left are the shorelines and coastlines that lead to many other lookouts (maybe a part of Bay of Martyrs). Looking right are the sediment rocks that poses as small 12 Apostles. Though not as splendid as 12 Apostles, it's still a sight to behold. Looking front are the open sea and a bit more of sediment rocks. It's tempting to go beyond the fences of this lookout but that is your choice. One of my friends went beyond these fences but still came back alright. It's just a bit scary since the soil is sand-like, somewhat slippery and somewhat weak. I would still suggest not to go beyond these fences for safety purposes as a 'slip' is very fatal. Many cultural sites are scattered throughout Victoria's coastal area. Today these layers of blackened shells (shell middens), scraping tools and other small artefacts, remain as indicators of a healthy and diverse diet and lifestyle celebrated over thousands of years. This coastal area is rich and diverse with plant and animal foods. 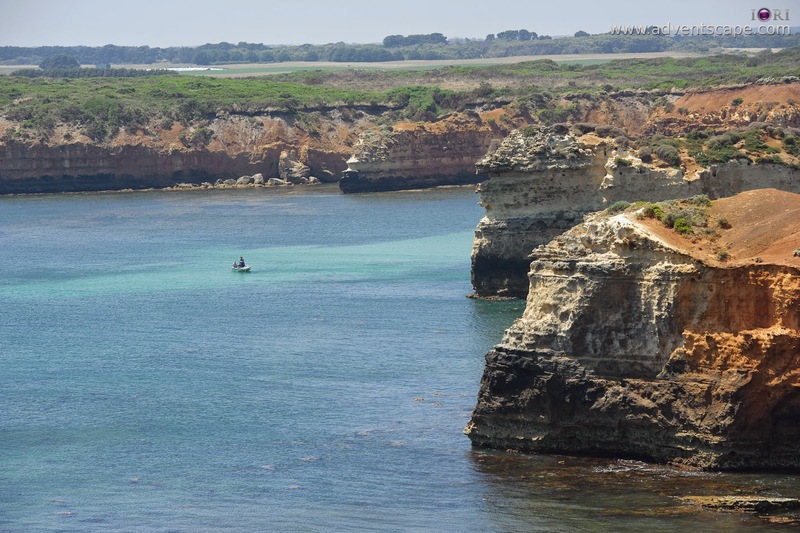 The diversity of plant and animal foods in this coastal area enabled a healthy diet and lifestyle to be sustained from seasonal abundant foods. The Kirrae Whurrong traditionally lived in small clans of several families. Curdies River yielded fish and eels while kelp and shellfish seafood were abundant among rockpools and rock platforms. Coastal scrub and bush provided a variety of small mammals, reptiles, fruits and berries. Clothing, medicines, shelter, tools and weapons were also sourced from these areas. European contact and settlement was disastrous for indigenous people. The Kirrae Whurrong population dropped to only a few within forty years. Conflict over land and stock along with introduced disease such as measles, smallpox and influenza caused extreme mortality rates. Displacement from traditional hunting areas resulted in violent clashes and a number of massacres. Massacre Bay is reputed by indigenous and European oral history to be the site of one of several massacres in this area. Indigenous survivors of disease and conflict were gathered together at various Mission sites across Victoria, eg Lake Condah, Ebenezer and Lake Tyers, for their protection, education and integration. Australia's history had been changed forever. Shell middens are an essential part of Australia's ancient and ongoing history. Further information about Australia's indigenous cultural heritage in this area can be obtained by contacting the South West Wimmera Cultural Heritage Program through Parks Victoria Information Centre on 13 1963. We were fortunate enough that this day was a sunny day. The path is pure soil, no rocks or wooden footpath (the only wooden footpath, is the lookout). If it were raining, it would be messier. I would also wish for a cloudy day. There were no shades so a break from the sun, via the clouds, is always welcome! Sunscreen of SPF-30 is highly recommended. 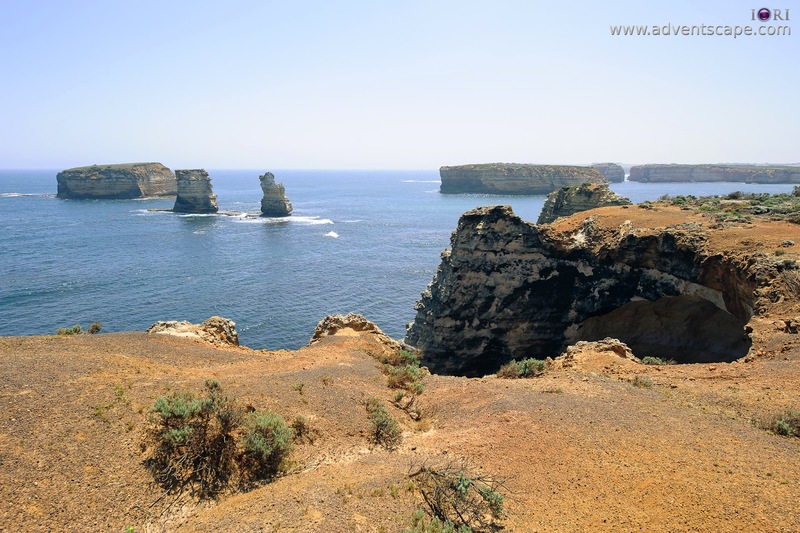 Bay of Islands is definitely one of the better lookouts when touring on the Great Ocean Road. I would highly recommend this place because it's easy to go here, it's less crowded and only requires short time to enjoying this place. Copyright © 2018 Adventscape | All Rights Reserved.